A DISTRICT COURT judge relocated his court sitting to a mucky field in south Galway in a bid to resolve an ongoing dispute between two neighbouring farmers over the construction of a wall. 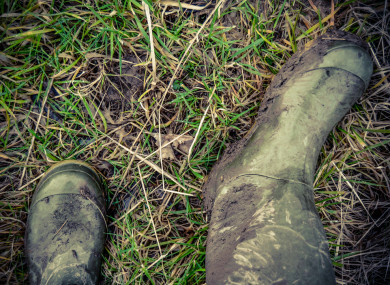 Judge Patrick Durcan left his judicial garb behind and put on a pair of borrowed garda-issue ‘wellies’ after gardaí told him that he wouldn’t be able to access the field without wellingtons. Judge Durcan said that he would preside over what he called “a special sitting of Cahermore District Court near Kinvara” in the mucky field in the townland of Cahermore. At Gort District Court, Judge Durcan compared the row between one-time friends, Brian Gill (37) of Cahermore, Kinvara and Brian Murphy (38) to the ongoing row over the ‘Trump Wall’ in the US. We have someone else in the world, Mr Trump who is dividing our world in a huge way and who has stopped government operating in the biggest democracy in the world – all over a wall – and we now have this Great Wall of Cahermore that I’m sure is dividing a village. Accompanied by four gardaí, a court registrar, solicitors for the two farmers and the farmers themselves, Judge Durcan made the ten mile journey from Gort court to the farmland at Cahermore where the judge heard submissions from each side in the shadow of the five foot stone wall before ruling on what happens next in the dispute. However, the trip to the lands didn’t stop two the two farmers bickering in front of Judge Durcan as their bitter row continued. Last year, Judge Durcan warned Gill that he faced jail if he didn’t finish his part of the wall and both farmers have completed their part of the 3km long wall dividing their lands. According to solicitor for Murphy, Olivia Lynch, Gill’s work in completing the wall had damaged Murpy’s lands as significant bushes, trees and stones were thrown out on Murphy’s lands when there was no need to do that. Lynch told the district court that leaving aside the damage to Murphy’s lands, Murphy now runs the risk of having his Basic Payment Scheme payment reduced because of the damage. Solicitor for Gill, Colm MacEoin said that on Tuesday of this week, Gill went in with a digger to clear debris from the Murphy lands arising from the construction of the wall. MacEoin said that he received a phone-call from Lynch on Tuesday for Gill to remove the digger as it was churning up the field in the wet conditions and Gill complied. The debris on the Murphy lands remains to be cleared up and at the wall, Gill told Judge Durcan “no matter what day I will say I will go on in, there is going to be a problem”. Judge Durcan remarked that both men “are sitting on valuable farms”. At a previous court sitting, MacEoin said that there was ‘bad-blood” between the two men. Judge Durcan said that Gill has responsibility to remove the debris from the Murphy lands and this must be done when weather conditions allow and that he is not bringing his digger “into a swamp”. Judge Durcan said that the offer of two bags of grass seeds by Gill to re-seed the lands affected is a reasonable one. Judge Durcan said that he was very glad that he has come out to view the scene. Gill made the undertaking to complete the wall arising from the State charging him with the assault of his neighbour, Brian Murphy on November 22nd 2016. Last month at Ennis District Court, Gill pleaded guilty to a separate public order charge involving Murphy on November 24th last. The court was told that Murphy alleged that Brian Gill shouted abuse at him on 24 November and shouted at him “come over here, you f**kin tinker’. Judge Durcan said that there would no conviction from the public order case if the wall was complete. At the wall, Judge Duran said that he would allow the two solicitors from each side to decide when was the best time for the digger go on the Murphy lands to clear the debris. Email “Judge relocates court sitting to mucky field for farmers' dispute over a wall ”. Feedback on “Judge relocates court sitting to mucky field for farmers' dispute over a wall ”.